The information about Sergei "touching" Dimitri came from a book by Greg King. It seems it was widely believed in Russian Circles. There was wide sympathy for Ella being married to "that person" that even Ella had to write to QV to refute the rumors that she was unhappy with her husband. Even though VMH liked Sergei but I don't think even she understood him. His wanting children stem from possessiveness rather than unconditional love. 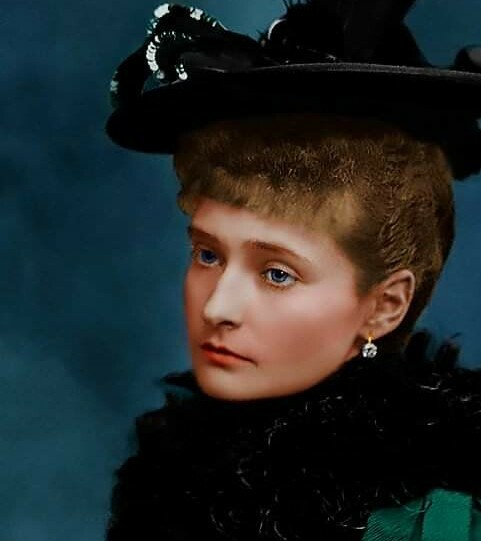 Grand Duchess George (Greek Minny) said openly in her autobiography that Maria Paulovna the younger was selfish, thus siding with Ella. So I don't trust too much on her bio that she blamed everybody but herself. It is also true that both Dimitri and Felix both loved Ella, so it boils down to who you believe. We may assume that he can't be a father type given the fact that as a young man, he saw his parents going through difficult times. Statistics show (well, as far as I know) that people who grew up in such family environment have hard time being parents. Not only Serge, Ella grew up with her parents who also quite had a rocky marriage so the negative views of Marie Pavlovna on her being a mother may be supported with that theory, too. The information about Sergei "touching" Dimitri came from a book by Greg King. It seems it was widely believed in Russian Circles. There was wide sympathy for Ella being married to "that person"
I still highly doubt if that was true. If I remember it right, the Russian circles at that time were all avid attackers of Sergei's mysterious personality so they loved assuming that rumor as true although there's no concrete proof .. and they surely hadn't cared to look for proofs because they only like to believe what they want to believe. And because that's been widely believed, the rumor became the "truth". Why did Ella and Sergei not have children? I'm sure you can find many educated guesses in this 34-page thread devoted to the subject! My personal view, insofar as it is relevant, is that one or the other was infertile. Infertility was not so very uncommon then, and quite a number of royal and aristocratic marriages were childless. One near-contemporary example is Friedrich Wilhelm IV of Prussia (1840-61) and Elizabeth of Bavaria, who had an apparently happy marriage, but no children. Thank You so much for this information. As I have to order these books from abroad, it is always a bit of a gamble not knowing what you'll get without being able to look through the book before buying. So I guess I'll keep looking for the book you mentioned. I found GD Sergei's correspondence in Volume 3 most interesting, especially with GD Paul and GD Konstantin, therefore I'm really looking forward to seeing the tone of GDss Elizabeth's letters. In the 4 Volume there are no GDss Elizaveta's letters. I’ve decided to write a bit on GD Sergei and GDss Ella’s engagement as seen from Sergei’s POW (sources taken from GD Sergei’s 4 Volume biography in Russian). I have sort of swiped over Queen Victoria’s side of the whole engagement, but quite superficially. I’m still waiting for my book of QV’s letters to Victoria of Hesse (which I’ll hopefully get in February). So if you know more on that side of the story, I would be very happy to hear it. And sorry for my English, it's not my first language (and neither is Russian), so I’m trying to translate as well as I can. The first time I could find Sergei write anything about Ella is in a letter to GD Konstantin on 3 Nov 1882, where he says that he's paid a visit to GD Louis of Hesse: “his daughters are really beautiful. There are rumours that I’m getting married, but they should not be believed and in truth we are still very far from it”. The next mention I can find is from 8 Feb 1883 when he writes to GD Konstantin regarding Konstantin's engagement and says he thinks he himself "wouldn't be worthy of such happiness, even though the happiness was so close and so possible. But I'm not losing hope - everything is in the hands of God. Hope and patience." The beginning of 1883 is also time when there is a lot of gossip about GD Sergei in St. Petersburg and he writes quite desperate letters to GD Konstantin trying to understand the causes. Konstantin replies that he knows Sergei too well to believe the gossip and concludes that because of how their elder brothers acted before, they can’t do anything without being criticised now. In summer he tells about his wish to marry Ella to his tutor and friend Arseniev. Arseniev and GD Paul exchange letters on the subject, bet Sergei doesn’t tell Paul himself. At this time Ella is in England with Queen Victoria. On 26th August he writes to GD Konstantin that all his plans need to be postponed and that he would explain this when they meet in person. (I guess this is about the time when Ella returned from Queen Victoria, who had made her promise that she would never marry a Russian). So here’s the question – was there a first proposal that Ella turned down or wasn’t there? To me it seems that there was not an official proposal, but that there may have been some sort of discussion on the subject, since Queen Victoria is so very vexed about the possibility that Ella could marry a Russian. As I understand, he had asked to come to Darmstadt some time in September 1883, but puts it off all the time. He travels around Europe in a rather foul and philosophical mood and manages to have a couple of fights with Paul via letters (Paul is getting sort of jealous, repeating that Sergei doesn’t need him in his life anymore). They sort it out as soon as they meet in person when Sergei unexpectedly visits Paul on his birthday. It's interesting that he only really speaks to GD Paul about his marriage on 5th Nov 1883, right before he leaves for Darmstadt for the engagement, even though by the time Paul knew all about Sergei's plans from other sources. But they have a very cordial discussion in the night that leaves them both very emotional. The next day Sergei is already in Darmstadt. He also didn't want anyone to know that he was there, because he didn't want any kind of gossip. He asked Paul to send telegrams in his name (so they wouldn’t know that he sends them from Darmstadt). He has a very nice and long chat with GD Louis of Hesse while playing billiard and everything is arranged; 5th November becomes the date of their unofficial engagement, which they later celebrate each year, giving each other little gifts. He also writes to his brother Alexander III and asks him not to tell anyone, because the wedding would only be in summer (because they feared that Russian winter would be too harsh for Ella in the beginning) and therefore until then there would be an awful lot of gossiping otherwise. For now he only tells his very closest - his siblings and a couple other of the closest people. He stays in Darmstadt until 19th of November, quite disappointed that Louis leaves for a hunt (which, according to custom, means he can't see Ella) and that Vicky (Queen Victoria’s daughter) is coming to visit, though they do end up being mutually very friendly. Sergei writes to Konstantin from Darmstadt without telling anything, and GD Konst. replies “I don’t understand your behaviour concerning Darmstadt. All the world is talking about your engagement. What are you doing there if you don’t count on it and why don’t you write to me about your plans?” However, the next week Sergei meets GD Konstantin and his fiancee in Altenburg, so I guess he told him in person. When he returns to St. Petersburg, there are already rumours, some of them so nasty, he writes to Paul that he "can’t even repeat". On New Year’s Eve he writes to Paul that it has been a “Good Year”. “[..] We went right to the Neues Palais, where was the happiness of meeting Ella. I forgot to tell that Shpunia [Sergei’s dog] is with me. There were dinners and dances (where he danced with Ella a lot, but thought the way they waltz in Germany is awful.) etc. He returns for a few days to Darmstadt again on 9th -14th May. And then he sends a train decorated with white flowers that would take Ella and all her family to St. Petersburg.